The current world population of 7.6 billion is expected to reach 8.6 billion in 2030, 9.8 billion in 2050 and 11.2 billion in 2100, according to a new United Nations report being launched today. With roughly 83 million people being added to the world’s population every year, the upward trend in population size is expected to continue, even assuming that fertility levels will continue to decline. The World Population Prospects: The 2017 Revision, published by the UN Department of Economic and Social Affairs, provides a comprehensive review of global demographic trends and prospects for the future. The information is essential to guide policies aimed at achieving the new Sustainable Development Goals. The new projections include some notable findings at the country level. China (with 1.4 billion inhabitants) and India (1.3 billion inhabitants) remain the two most populous countries, comprising 19 and 18% of the total global population. In roughly seven years, or around 2024, the population of India is expected to surpass that of China. Among the ten largest countries worldwide, Nigeria is growing the most rapidly. Consequently, the population of Nigeria, currently the world’s 7th largest, is projected to surpass that of the United States and become the third largest country in the world shortly before 2050. From 2017 to 2050, it is expected that half of the world’s population growth will be concentrated in just nine countries: India, Nigeria, the Democratic Republic of the Congo, Pakistan, Ethiopia, the United Republic of Tanzania, the United States of America, Uganda and Indonesia (ordered by their expected contribution to total growth). The group of 47 least developed countries (LDCs) continues to have a relatively high level of fertility, which stood at 4.3 births per woman in 2010-2015. As a result, the population of these countries has been growing rapidly, at around 2.4 % per year. Although this rate of increase is expected to slow significantly over the coming decades, the combined population of the LDCs, roughly one billion in 2017, is projected to increase by 33 % between 2017 and 2030, and to reach 1.9 billion persons in 2050. Similarly, Africa continues to experience high rates of population growth. Between 2017 and 2050, the populations of 26 African countries are projected to expand to at least double their current size. 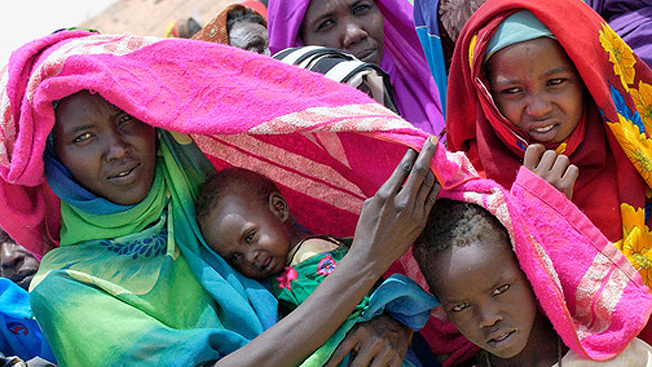 The concentration of global population growth in the poorest countries presents a considerable challenge to governments in implementing the 2030 Agenda for Sustainable Development, which seeks to end poverty and hunger, expand and update health and education systems, achieve gender equality and women’s empowerment, reduce inequality and ensure that no one is left behind. In recent years, fertility has declined in nearly all regions of the world. Even in Africa, where fertility levels are the highest of any region, total fertility has fallen from 5.1 births per woman in 2000-2005 to 4.7 in 2010-2015. Europe has been an exception to this trend in recent years, with total fertility increasing from 1.4 births per woman in 2000-2005 to 1.6 in 2010-2015. More and more countries now have fertility rates below the level required for the replacement of successive generations (roughly 2.1 births per woman), and some have been in this situation for several decades. During 2010-2015, fertility was below the replacement level in 83 countries comprising 46 % of the world’s population. The ten most populous countries in this group are China, the United States of America, Brazil, the Russian Federation, Japan, Viet Nam, Germany, the Islamic Republic of Iran, Thailand, and the United Kingdom (in order of population size). The report highlights that a reduction in the fertility level results not only in a slower pace of population growth but also in an older population. Compared to 2017, the number of persons aged 60 or above is expected to more than double by 2050 and to more than triple by 2100, rising from 962 million globally in 2017 to 2.1 billion in 2050 and 3.1 billion in 2100. In Europe, 25% of the population is already aged 60 years or over. That proportion is projected to reach 35% in 2050 and to remain around that level in the second half of the century. Populations in other regions are also projected to age significantly over the next several decades and continuing through 2100. Africa, for example, which has the youngest age distribution of any region, is projected to experience a rapid ageing of its population. Although the African population will remain relatively young for several more decades, the percentage of its population aged 60 or over is expected to rise from 5% in 2017 to around 9% in 2050, and then to nearly 20% by the end of the century. Globally, the number of persons aged 80 or over is projected to triple by 2050, from 137 million in 2017 to 425 million in 2050. By 2100 it is expected to increase to 909 million, nearly seven times its value in 2017. Population ageing is projected to have a profound effect on societies, underscoring the fiscal and political pressures that the health care, old-age pension and social protection systems of many countries are likely to face in the coming decades. Substantial improvements in life expectancy have occurred in recent years. Globally, life expectancy at birth has risen from 65 years for men and 69 years for women in 2000-2005 to 69 years for men and 73 years for women in 2010-2015. Nevertheless, large disparities across countries remain. Although all regions shared in the recent rise of life expectancy, the greatest gains were for Africa, where life expectancy rose by 6.6 years between 2000-2005 and 2010-2015 after rising by less than 2 years over the previous decade. The gap in life expectancy at birth between the least developed countries and other developing countries narrowed from 11 years in 2000-2005 to 8 years in 2010-2015. Although differences in life expectancy across regions and income groups are projected to persist in future years, such differences are expected to diminish significantly by 2045-2050. The increased level and reduced variability in life expectancy have been due to many factors, including a lower under-five mortality rate, which fell by more than 30 % in 89 countries between 2000-2005 and 2010-2015. Other factors include continuing reductions in fatalities due to HIV/AIDS and progress in combating other infectious as well as non-communicable diseases. There continue to be large movements of migrants between regions, often from low- and middle-income countries toward high-income countries. The volume of the net inflow of migrants to high-income countries in 2010-2015 (3.2 million per year) represented a decline from a peak attained in 2005-2010 (4.5 million per year). Although international migration at or around current levels will be insufficient to compensate fully for the expected loss of population tied to low levels of fertility, especially in the European region, the movement of people between countries can help attenuate some of the adverse consequences of population ageing. The report observes that the Syrian refugee crisis has had a major impact on levels and patterns of international migration in recent years, affecting several countries. The estimated net outflow from the Syrian Arab Republic was 4.2 million persons in 2010-2015. Most of these refugees went to Syria’s neighbouring countries, contributing to a substantial increase in the net inflow of migrants especially to Turkey, Lebanon and Jordan. The 2017 Revision of World Population Prospects is the 25th round of official UN population estimates and projections that have been prepared by the Population Division of the United Nations Department of Economic and Social Affairs. The 2017 Revision builds on previous revisions by incorporating additional results from the 2010 and 2020 rounds of national population censuses as well as findings from recent specialized sample surveys from around the world. The 2017 Revision provides a comprehensive set of demographic data and indicators that can be used to assess population trends at the global, regional and national levels and to calculate other key indicators for monitoring progress toward the Sustainable Development Goals.